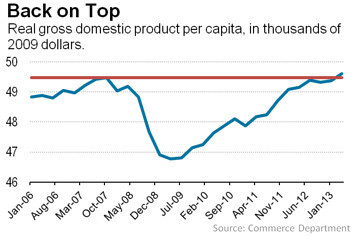 This chart from the WSJ Real Time Economics blog shows that the output per-person has finally returned to its peak in 2007. It’s not an unimportant milestone even though income and employment have yet to claw their way back. The article notes that taking satisfaction in this number needs to be tempered as we should be much higher had the economy continued to grow at its prior pace. This seems to be the common plaint on both the Left and the Right, “If only we had not had this horrible recession we would have grown this tree to the sky.” The economies of the mid 2000s were not realistic and their lofty numbers were based on over-priced assets. Calculating consumption in GDP numbers based on house prices which bore no resemblance to normal supply and demand metrics was simply self-delusional. Bemoaning an economy that hasn’t matched fairy tale levels is pointless. It’s time to get over our fixation with the concept of potential GDP based on fiction and quit using it as a pretext for political arguments on either side as well as economic schemes aimed at restoring something that never was.